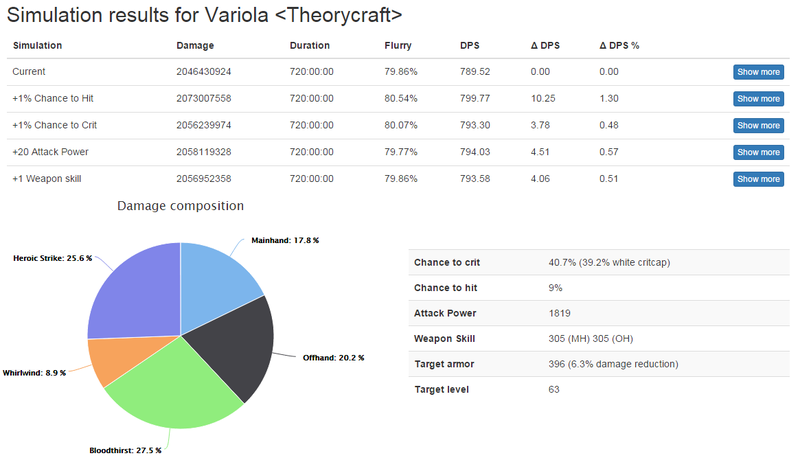 The purpose of this post is to request access to the simulation tool used to create the following image, specifically for fury warrior theory crafting. I stumbled upon your guild forums when searching for a solid simulation tool to verify my own fury warrior calculation spreadsheet and related findings. Specifically; I would like to verify my findings regarding the viability of using Death's Sting main-hand with Qiraji Pugio off-hand and Ancient Core Leather Gloves compared to the CTS and maladath combo(less competition on aforementioned items). I have given you a PM.